The skin consists of three main layers – epidermis, dermis and subcutis. Each layer has its specific structure and functions. These cells produce a dark pigment called melanin which contributes to skin color and provides UV protection. They are located at the bottom of the epidermis. These cells are involved in the epidermal immune system. They engulf foreign material that invades the epidermis and migrate out of the skin to stimulate an immune response. Small cells found at the bottom of the epidermis. Earlier it was believed that basal cell carcinoma is derived from these cells. As of this writing basal cell carcinoma is thought to arise from non-differentiated cells from the basal cell layer. The dermis consists mostly of connective tissue and is much thicker than the epidermis. It is responsible for the skin's pliability and mechanical resistance and is also involved in the regulation of the body temperature. The dermis supplies the avascular epidermis with nutrients by means of its vascular network. It contains sense organs for touch, pressure, pain and temperature (Meissner´s corpuscles, Pacinian corpuscles, free nerve endings), as well as blood vessels, nerve fibres, sebaceous and sweat glands and hair follicles. These are tiny pipes through which blood circulates. The blood vessels supply the skin with fresh blood, which contains nutrients and oxygen, and carry away waste products. These touch receptors are expecially effective in detecting light touch and soft, fleeting movements. Pacinian corpuscles function as receptors for deep pressure and vibration. Free nerve endings are sensitive to pain, temperature changes and itchiness. Sebaceous or oil glands are small, sacculated organs that secrete sebum. This oily substance is a natural moisturiser which conditions the hair and skin. Sebaceos glands are found all over the body, but they are more numerous in the scalp area and around the forehead, chin, cheeks and nose. These are sweat-producing structures consisting of a single tube, a coiled body and a superficial duct. They are involved in thermoregulation, as they cool the skin by sweating. Hair follicles are downward growths into the dermis of epidermal tissue and produce hair. They are found all over the body except on the palms of the hands and soles of the feet as well as on the lips. When the body gets cold, the hair stands upright with the help of the arrector pili muscle, closing up the skin's pores and keeping the warmth in. This small muscle is attached to the base of the follicle. When it is stimulated by cold or fright, it pulls the hair follicle up, causing it to stand upright. The subcutaneous layer below the dermis consists of loose connective tissue and much fat. It acts as a protective cushion and helps to insulate the body by monitoring heat gain and heat loss. Not all authors consider this layer a part of the skin, but it definitely has a strong impact on the way the skin looks. It is made of dead, flat skin cells, surrounded by specialised fatty substances (lipids). 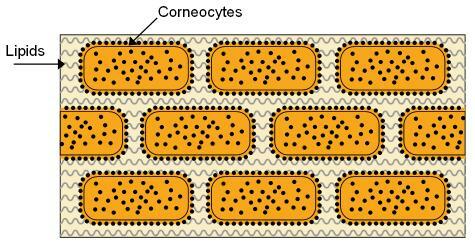 It can be likened to a brick wall, composed of cells (the "bricks") and lipids between the cells (the "mortar"). The primary function of the horny layer is to hinder water loss through evaporation from the interior. Besides, it protects from ultraviolet radiation, mechanical damage, foreign chemicals and germs.